10/18/2012- At the end of September 2012, Twonky released a new upgraded version of their Server module. TwonkyMedia V7 is now available for all who wishes to display their multimedia content on their mobile device or through their DMA device. Paired with the latest Twonky7 modules, the users will now have access to a whole new multimedia experience. 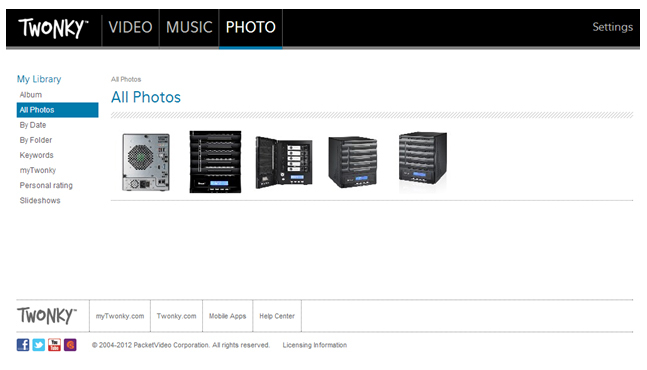 A home NAS is often used to serve multi-media content, including photos, music, and video to other devices or over the internet. Using standard protocols such as DLNA, users can access their media stored on the home server from any room in the house. Twonky is a family of software and applications for your PC, Mac® or mobile phone that finds all the digital media in your household and shares them with PCs, TVs, stereos and other devices connected to your network. With Twonky Server, you can make all of your stored digital files on your NAS free of use with your DLNA compliant home devices. Version 7 of the TwonkyMedia™ Server was a major release, meaning that a lot has changed. It goes from a new look for the UI layout, to new features (folder aggregation support) and passing by minor bug fixes (Windows 8 support). Overall this means a more complete, easier to use and flexible media file manager. Twonky really connects all of your DLNA appliances and gives them access to all of your media content. Users who wish to try out the latest TwonkyMedia™ Server can go to the Thecus® Download Center and download the module. Owners of a V6 license will also have access to V7. Enjoy the ultimate home entertainment experience with Thecus® and TwonkyMedia™.